One of the coolest places to spend a day in Cleveland, Ohio is the incomparable Rock and Roll Hall of Fame and Museum. Located downtown, on the shores of Lake Erie, at East Ninth Street, this impressive geometric glass structure is the work of renowned architect I.M.Pei. Celebrating its 20th anniversary, the seven-story architectural pyramidal masterpiece is the first museum in the world solely dedicated to the music of rock and roll. You can easily spend an entire day at this one-of -a kind world-class museum. I wish I had more time when I visited. A two-day visitor pass is actually available at a considerable savings over the $22 one-day ticket price. On its seven floors, this 150,000 square foot Rock and Roll Hall of Fame entices you with at least five film theaters and interactive exhibits which are ever-changing, as well as multi-media exhibits. Thousands of artifacts are on display, having been donated or loaned to the museum by the artists. Samples of these include Jim Morrison’s Cub Scout shirt, John Lennon’s eyeglasses, the Everly Brothers’ tap dance shoes, and Keith Moon’s velvet stage costume. You can also see Bono’s first guitar, Joe Walsh’s high school football jersey, and many of Michael Jackson’s stage outfits as well as his signature “Billie Jean” glove. Some of the personal items, like John Lennon’s report cards always generate a lot of attention. Cleveland had already established itself as the “Rock and Roll Capital of the World,” thanks to radio deejays, such as Alan Freed, who introduced the term rock and roll back in the 50’s. Largely in part due to a heavy marketing campaign by radio station WMMS, to collect over 600,00 signatures, Cleveland was selected to be the permanent home of The Rock and Roll Hall of Fame, which did not open until 1995. Close to eight million visitors have enjoyed this fun place, and today it is the number one tourist attraction of the city, and local Clevelanders lovingly refer to it as the Rock Hall. If you're a fan of Jimi Hendrix, the hand-written lyrics to Purple Haze are on display. So is some of Bruce Springsteen's jewelry, one of Cat Steven' guitars, Linda Ronstadt's jacket from her 1978 Back in the USA album cover, and a Tony Banks synthesizer. On the top floor is the actual hall of fame, and I found the experience extremely moving as I witnessed all the inductees’ autographs etched in glass. I can say the same for the multi-media film as I watched in awe the video collage of the inductees in an acoustically perfect theater. A total of 304 individual artists and 108 groups have been inducted to date. On April 18, 2015, the induction ceremony will be held in Cleveland at Public Hall. The 2015 inductees have recently been announced, and they include the Paul Butterfield Blues Band, Green Day, Joan Jett & the Blackhearts, Lou Reed, Stevie Ray Vaughan & Double Trouble, Bill Withers, the "5" Royales, and Ringo Starr. To meet eligibility criteria the nominees must have released their first recording 25 years ago or more. 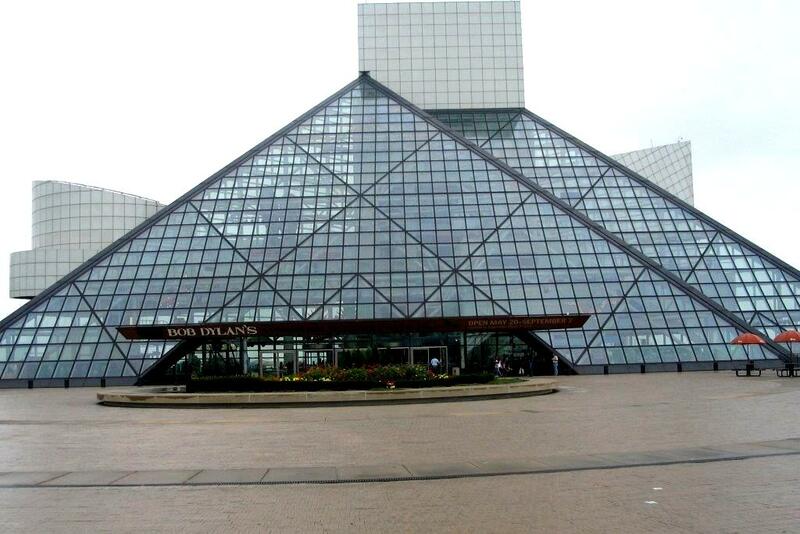 A visit to Cleveland is totally worth the stop just to experience the Rock and Roll Hall of Fame and Museum. If you're a rock and roll fan, it's a no brainer. Enjoy!